I’ve received a number of questions about using USA electrical appliances in Israel over the years and I decided to put together a post that covers most of the information you will need. Unfortunately, it’s a little complicated. 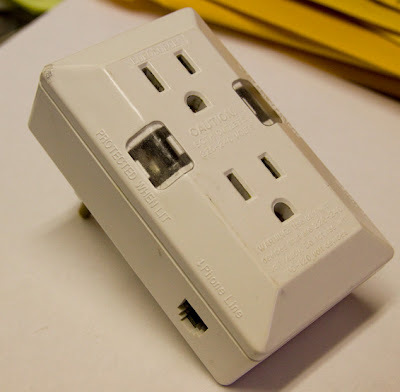 First, the plugs are a different style that the standard USA two prong flat plug. What makes this even more complicated is that you can encounter several different style plug receptacles in Israel. I think these variations are why some people report one kind of adapter worked fine for them in one location, while that same adapter will not work for someone else in a different hotel. Below are "H" style plugs, somewhat unique to Israel. Second, the electrical current in Israel is very different that what comes out of our USA outlets. USA power is 110 volts and 60Hz (or cycles). However, like much of the rest of the world, power is Israel is 220/230 volts and 50Hz. If you plug a 110v only appliance into a 220v socket, you will quickly destroy the device. 2. Have a transformer that will convert the 220v that comes out of the wall into 110v. -I have found that there are different types of plug receptacles in Israel. The oldest seem to have been designed for a two or three flat prongs, often designated as a (H) style plug (technically, SI 32). Some were designed for two round prongs. The biggest problems is that while many of these receptacles look like they should accept any two round prong European type plug, they often do not. 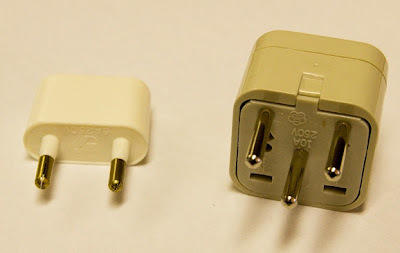 Most of the newer receptacles (post 1989) are designed to accept both the European (C) and Israel (H) style plugs, but not all hotels have newer receptacles. Look at this picture below. 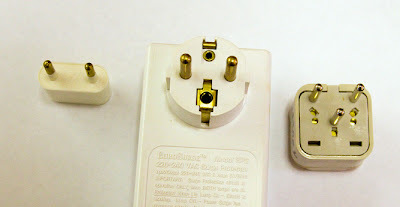 The European “shucko” type plug prongs in the middle look almost identical to the top two prongs of the other Israel adapters, but I will tell you it does not fit wall receptacles in Israel. 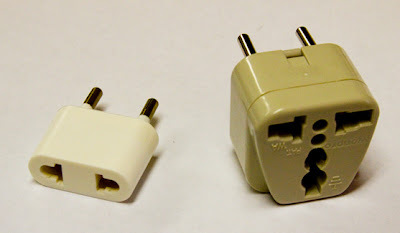 Shucko, or "F' style plugs have wider prongs than "C" style European plugs (Europlug - CEE 7/16). The rounds almost always seem to fit a outlet designed for flat prongs, but the flat prong adapters will sometimes not fit receptacles designed for round plugs. Stick with round and be sure the adapter is for Israel, not simply listed as being a “universal” or European adapter, they may not work. I have seen many web sites that tell you to use the 'European adapters' in Israel. Not exactly right, because there are several types of European adapters. 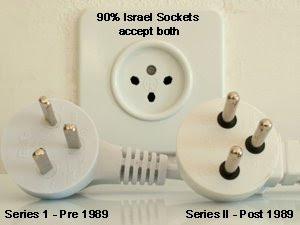 Buy either ones specifically listed for Israel (H) or the common two prong (C) - Europlug CEE 7/16. See my comments of surge protection below. Transformers are heavy electrical coils that take the 220v current and reduce it to 110v. They are rated according to the amount of current, or watts, they can convert. To put things simply, the more power your device pulls, the bigger a transformer you need. Unfortunately, devices like hair dryers and some hair straighteners take a lot of current. You may not really need one. 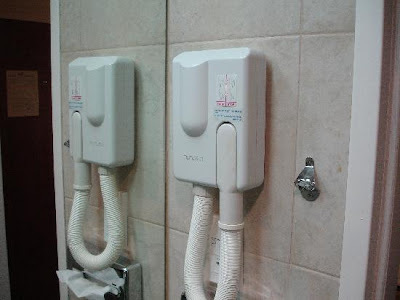 Almost all modern hotels now have a wall mounted hair dryer in the bathroom. That hair dryer will usually have a 110v ungrounded outlet on it. Unless you are staying in a historic hostel, a very old hotel, or a private home you probably don’t need to take a hair dryer. An electric shaver will easily work with the provided plug. So will most two prong camera battery and cell phone chargers. 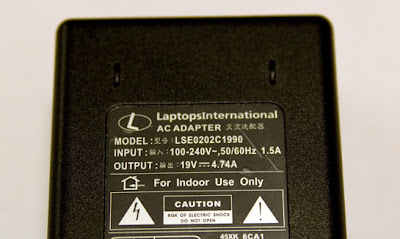 You may find that most of your newer electronic devices can run on both 110v and 220v. My computer, cell phone charger, camera battery charger, and even my Cpap breathing machine all run on both currents. Some devices have a 110v-220v switch you need to manually switch – don’t miss that detail. How can you tell? 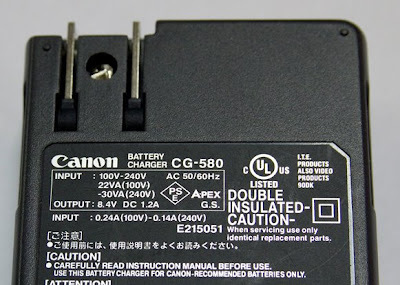 The device will almost always tell you on the side of the power pack itself, you just need good eyes. You'll see something like “100v-240v, 50/60Hz”. These devices you can plug right into an Israeli outlet with just an adapter. 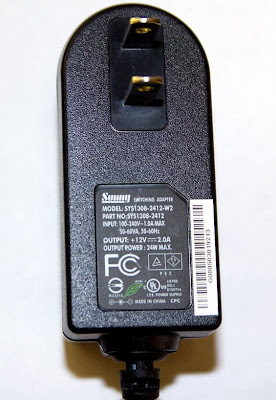 If you really need a device that requires a transformer, all I can suggest is that check the wattage of the appliance, then buy a transformer that is rated for at least 20% more capacity that your units calls for. If your device is 1600 watt, get a transformer that is rated for 2000 watts. 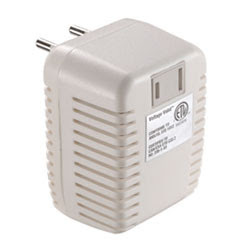 Finally, “converters” are cheaper and smaller that true “transformers”, but every electrical FAQ I have read suggests you not use them, because they do not truly convert 220v to110v and can still fry many devices, especially electronic devices. They do seem to work for short durations for things like hair dryers. I do suggest you avoid these if possible. You have been warned. Final note: I’ve had many people who work with electronics tell me it’s stupid to buy $500+ worth of electronics and plug it into a wall socket without a surge protector. One power surge can fry the whole unit. I think the advice is good on the road too, so I take a travel surge protector with me. I almost always need two spots to plug stuff in, so this also helps out here. Note that this unit has a European style Shucko plug. 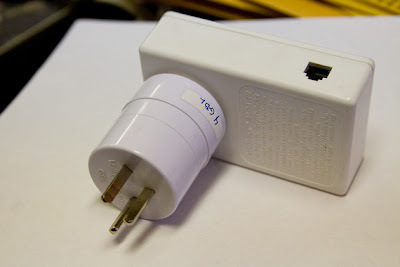 You need an adapter for any country, like Israel, that doesn’t use the standard Shucko plug (F). This is the unit with the Israel adapter, which I might add, did not work in some outlets (flat prongs). I had to plug it into an adapter plug first, then into the wall. Go figure. 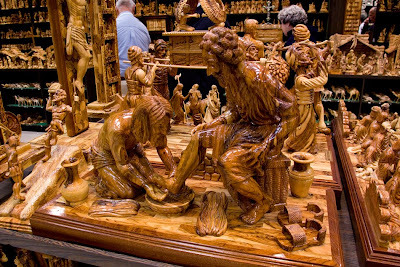 I had several conversations with people about buying Olivewood Nativity sets from Bethlehem. They are a beautiful and unique souvenir to bring home from Israel and almost every bus tour that goes to Bethlehem stops at some shop that sells them. (You should be able to click on the pictures for a larger version). 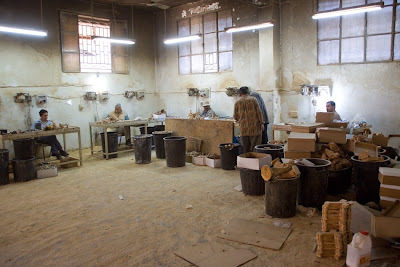 On our last trip, while our group was upstairs getting the hard sell from the sales staff at one particular store, I slipped downstairs to get a few pictures of their production facility. I won’t tell you where this is, because I find this is one of my least favorite places to stop and shop. 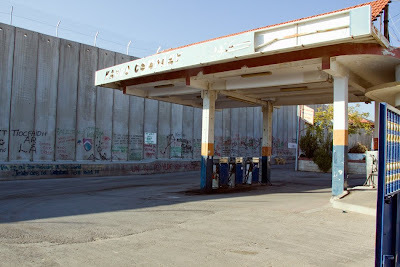 Prices are higher than the normaly inflated Bethlehem tour-bus-stop prices and I found the sales staff downright pushy. 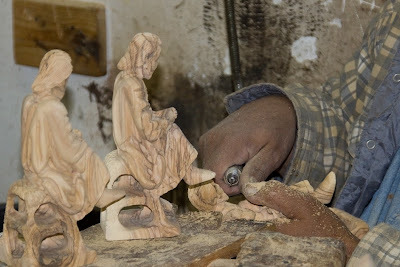 Bethlehem has many garages and warehouses where people carve out nativity sets. The place I took these pictures is larger than most. The pictures aren’t the highest quality. 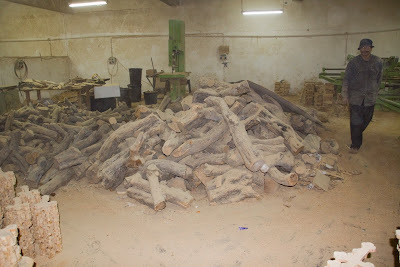 It was a bit dark and a haze of wood dust hung in the air. I also didn’t want to get in right the workers faces, so I took the shots from a distance. Each person seems to work on one specific figure at a time, often using an identical figure as a model. I was first a little put off by the fact that this looked a little like a sweatshop. 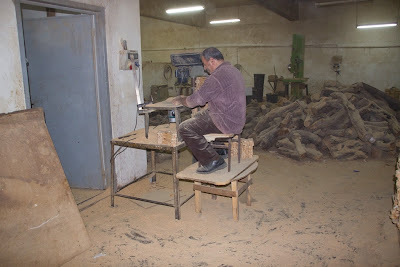 But the reality is that unemployment in Bethlehem is high and jobs are scarce. A job like this is steady work and a relatively safe and secure environment, even if that doesn’t look like what we’re used to here. OSHA would probably not approve of this workstation. 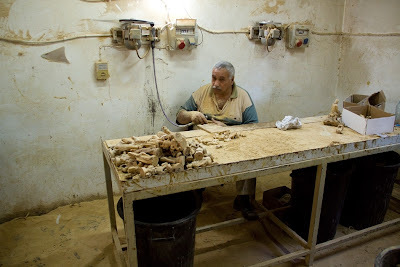 My experience is that prices for Olivewood nativity sets are higher in the stores in Bethlehem than what you will find in the smaller stores in Jerusalem’s Old City or even some of the hotel gift shops. That has always seemed counterintuitive to me, but I suppose that the factors of both location and next door competition are a big factor. If you plan to buy a set and price is the biggest concern, I suggest you buy in Jerusalem. You could save 40%. 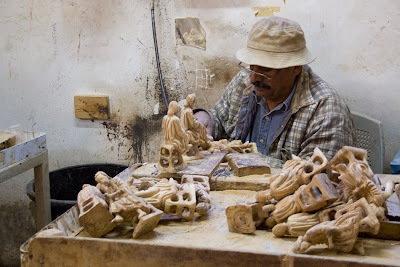 Be sure the set is actually carved by hand and is not simply wet Olivewood that has been formed in press – those figures will likely crack when they dry. 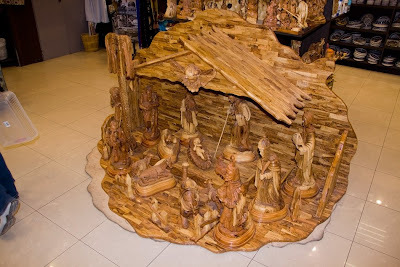 Also, be aware that Olivewood nativity sets are now being shipped in from China and sold by some in Jerusalem shops at lower prices. I don’t mind spending a little more for a set in Bethlehem because I think the people there need the support and you are less likely to be sold junk. My favorites store is Kando’s. It near Rachel’s Tomb. It was started by the cobbler who was brought the first Dead Sea Scroll by the Bedouin boy who found it (and asked him to make shoe laces out of the leather). Kando used the money he got from being a middle man for the Scrolls to open a store. 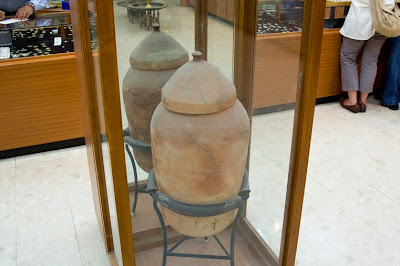 They still have the original Dead Sea Scroll jar that the Isaiah scroll was stored in right there in the store (worth the trip alone). The store is now run by his grandson Shibli, who is a delightful and friendly host. Yes, their prices are higher than Jerusalem, but I like supporting a Christian family who continues to exist under such hard circumstances. Remember, don’t pay their asking price. Expect to pay about 75% of the price they first ask; perhaps less of you’re buying a very expensive set or multiple items. Don’t be put off by the look of the store on the outside. The staff is friendly, not especially pushy, and I found them basically honest about what they sell. 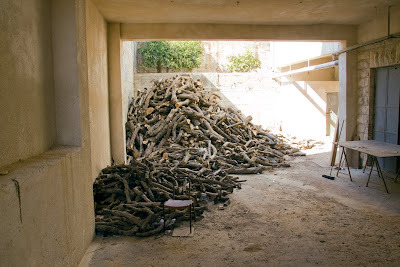 Just don’t be surprised if you find a similar item in Jerusalem’s souk for less –consider this a “fair trade” purchase that will help a group of people who have had it very tough for several generations.